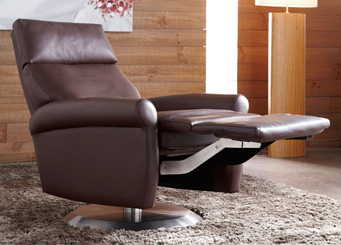 The uncommonly-stylish Comfort Recliner™ by American Leather. We know you love recliners, just not everything about them. Along with the Comfort Sleeper by American Leather, our award-winning engineers embarked on a two-year mission to create the ultimate in relaxation. The Comfort Recliner™ by American Leather features the Infinity System which offers unlimited ergonomic adjustability to support you where your body needs it most. The headrest moves up and down and also angles forward, so you can relax in cradled comfort. And, unlike most recliners, the back and footrest work independently and smoothly with infinite stopping positions. Take your relaxation seriously. We know you love recliners, just not everything about them. So our award-winning engineers embarked on the two-year mission to create the ultimate in relaxation. We’re proud to bring you the Comfort Recliner by American Leather® featuring a personal, infinite-position system that adjusts to your exact comfort needs. The Infinity System™ features a back and footrest that operate independent of each other and can stop in any position, a fully adjustable headrest pillow and a height-adjustable base. All this is wrapped up in an elegant look that brings style to any room in your home. There are even four sizes to choose from, plus hundreds of fabrics and leather choices to complete your look. The Comfort Recliner™ is a recliner for people who take their relaxation seriously. Find your perfect position. The Infinity System™ offers unlimited ergonomic adjustability to support you where your body needs it most. The headrest moves up and down and also angles forward, so you can relax in cradled comfort. And, unlike most recliners, the back and footrest work independently and smoothly with infinite stopping positions. The adjustable swivel base allows you to set the chair at your perfect seat height, even on the power option. Stretch out anD stay a while. The Comfort Recliner™ gas cylinder-assisted footrest smoothly stops in any position without clicking or ratcheting. With an effortless push of a button, the powered comfort recliner raises the chaise-style ottoman to your desired position. the footrest can also be raised with a smooth pull of the stainless steel comfort release™ on our manual comfort recliner. In the open position, the chair has an elegant, stainless-steel footrest extension that hides all mechanical linkages and accentuates the full-length ottoman. Create your perfect look. Choose from over 200 fabric and leather choices, including options that are great for kids and pets. Our leathers are among the finest available: full aniline-dyed for beauty, softness, and supple hand. Various finishes provide subtle sheens, thick pebble grain or smoother textures to fit perfectly with your décor.